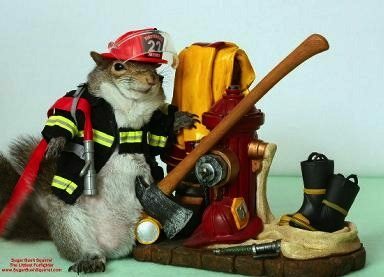 Sammy the Squirrel started a grass fire in Edmond…. When I first bought my house, there was a retired man living behind me that would shoot squirrels with a BB gun. He was relentless. He’s shoot at them as they played in the trees, climbed power lines, and crossed the fencing between our backyards. If you didn’t know better, you would have thought a squirrel killed his family and he was the ex-cop looking for revenge, which by the way, would make an excellent show on FX. His obsession with dead furry creatures created some drama with me and other neighbors. For one, every time he’d hit a squirrel the thing would live just long enough to make it to my yard and die. Know what’s not fun? Having your dog bring a dead squirrel carcass into the house. Two, the guy had terrible aim. He hit two windows in my backyard and damaged my siding. He also broke out a window in the house next door to me. Instead of doing what I did and asking the guy to pay for the damages (which he did), the lady who owned the house called the cops on him. I’m not sure if it was related, but the old man moved out about a year later. Anyway, I guess there was a reason for my ex-neighbor’s madness. Despite being cute and indecisive about crossing roads, squirrels are pests. They can damage your home, property and even start dangerous grass fires. Fire investigators believe a squirrel may have caused a grass fire Sunday. About 2 acres burned near West Simmons Road and South Kelly Avenue in Oak Cliff. Firefighters say the blaze got dangerously close to a nearby home. Crews said there were no power lines or cigarettes and no cars that drove through the area. However, they think a squirrel may have been burned on a power line and spread the fire to the grass. When BuzzFeed posts their “23 Adorable Photos of Burned Squirrel Carcases,” this one better be included. Actually, this story was disappointing. I was hoping it would be more fun. I don’t know, like maybe the squirrels were lighting fireworks, lost control of a campfire or some old retired man was burning their bodies. Yeah, the last one’s not very fun, but it would have tied everything together. This beats a recipe for Chicken Fried Squirrel. Or does it? Has it taken you six years to figure this out? And you left out typos. I can’t trust a species that consistently runs back into danger after clearing traffic – that’s just unnatural.